Shared Zone Golf Cart Signs are a useful tool to help meet safety compliance and guidelines. Create a safe workplace and keep employees protected with our Parks, Reserves and Environment Signs. Shared Zone Golf Cart Signs manufactured and shipped out of Queensland, Australia. 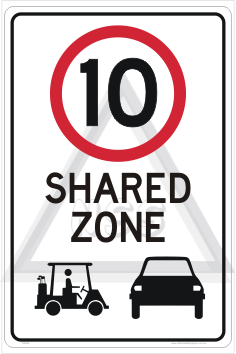 Shared Zone Golf Cart Sign 10KPH. Erect wherever danger exists of Golf Buggies and cars colliding.